In recent times, as smartphones have become increasingly homogenous in terms of design, color has made a big come-back as a major differentiating factor. In the pre-smartphone days, cell phones used to be quirky and colorful — many of them, anyways — but as physical keypads made way for immersive touch screens, sending prices on a never-ending hike, people started taking their pocket computers seriously. A bit too seriously, perhaps. Suddenly, most everything was black, white, or silver. Thankfully, over the last year, smartphone manufacturers have decided to bring some much-needed vibrancy to their products – a trend that arguably started with Huawei's P20 Pro and its dazzling gradient finish, and continues still. There have been rumors going around that Samsung plans to introduce gradient color schemes of its own to the Galaxy S10 family next year. Unfortunately, we don't know yet whether these would be limited to the Galaxy S10 'Lite', or would also grace the backs of the more expensive S10 and S10+ models. We wouldn't be too surprised if, like Apple with the budget iPhone XR, Samsung too opted to make its cheapest flagship model the most colorful as well. We recently made a series of Samsung Galaxy S10 concept renders where we explored various possibilities for the upcoming flagship, including what the gradient color options could look like. Now, however, we've got a sneak peek at a real Galaxy phone with a gradient color finish. 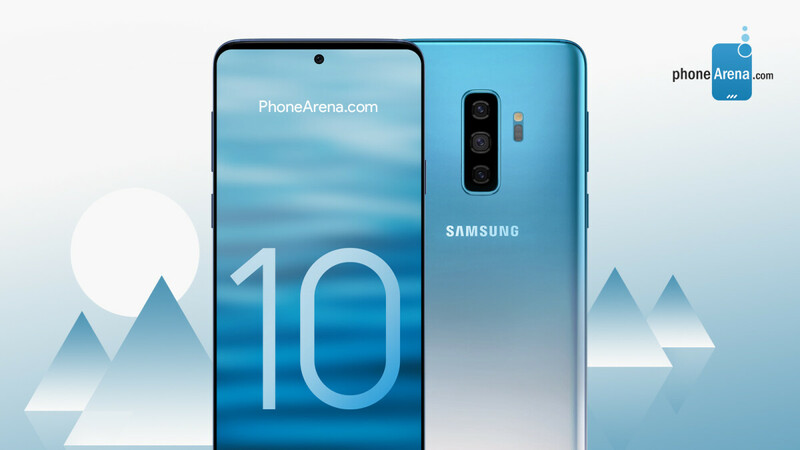 Unfortunately, it is not the Galaxy S10, but rather the Galaxy S9, which is launching a new color in China – "Ice Blue." As per mobile tipster @UniverseIce, who earlier leaked images of the handset, the Ice Blue version of the Galaxy S9 will have a blue to white gradient paint job, and if the images are anything to go by, it looks quite pleasing. Could this also be one of the color options for the Galaxy S10? Only time will tell, but it's a first glimpse at what's coming. Samsung launched the "ice blue" Galaxy S9/S9+ in China. Update: The Ice Blue Galaxy S9 is launching in Europe under the name 'Polaris Blue.' Samsung has announced that the Galaxy S9 and S9+ in Polaris Blue will launch in Germany in early December. The main difference between the models seems to be in the built-in storage. The Ice Blue Galaxy S9 and S9+ are available in 128GB, while the Polaris Blue model was listed by Samsung in only 64GB. Other than that, both models seem to be identical and sport the same blue-to-white gradient paint job on their backs. Why are you keep posting this stupid renders. They are simply wrong. We've got enough informations to create something better. Because they make that picture above? - They hear S9 got new color. - Kick-off photoshop. - Write article about it. - Wait till other sites spread this image. - .... - Profit? I wanna see it, cause it let's me know what the next king will look like...the Note 10. I like it. Samsung's doing gradients right...Huawei's 20 Series gradients look good, but they're too flashy for my liking. Samsung needs to do a fire red one now. Knowing Samsung this color will not be coming to the US. I just want a white Note 10 please. What happened to the horizontal camera layout? I know that's just a render but why the tiny hole up top? On OLED, you wouldn't be able to see the camera just like you cant see the one used for the optical fingerprint scanner in the oneplus 6t.